Shop AKG WMS45 Perception Wireless Vocal Set Handheld Microphone System from AMS with 0% Interest Payment Plans and Free Shipping. transmitter features a spring-steel wire mesh front grill to protect the dynamic transducer from the hardships of onstage use. Its cardioid polar pattern ensures maximum gain before feedback and makes your voice cut through any mix. Good for small events requirig a single HH. Not networkable for larger venues or to link to wireless workbench. I got this as a back up HH to bring as an A1 / A2. I have not tested non line of sight. But line of sight no issues as of yet having the item for a month. Db response is not bad- but seemed to peak out a little over 20db or so. So for loud shouting or rapping- the element may not hold up as well as other mics. Singing with good mic technique and speech is fine. Not good for dj gigs sounds like your talking threw a tunnel. I do not recommend at all. I exchange this for shure handheld wireless microphone. Good quality sound, nice range. Sound quality is very good and range is as advertised. Only knock is the poor battery compartment on the mic - hard to close and afraid it will break with regular use. other than that, very easy to use and get a quality sound. Would definitely buy again. This wireless microphone is WAY better than I expected! I originally purchased this microphone to use mostly for speaking presentations, thinking that I'd use it as a back-up vocal mic. I play keyboards, so a corded mic suits me fine. I absolutely LOVE this wireless mic! It is now my main vocal microphone. It sounds great! It's crisp, clear, punchy, and outperforms other wireless mics at 4 times the cost! The range is very good with a fresh battery. I've used this mic for presentations in a high school gymnasium, and never had any problems with range or interference. But I've noticed that when the battery in the transmitter gets weak, you will lose range. A fresh battery will last a good 8 hours. As with any battery operated device, be sure to carry extra batteries! Great solid Mic, this is my 3rd AKG Mic love them! Crystal clear audio, rugged and affordable ! Thanks ! 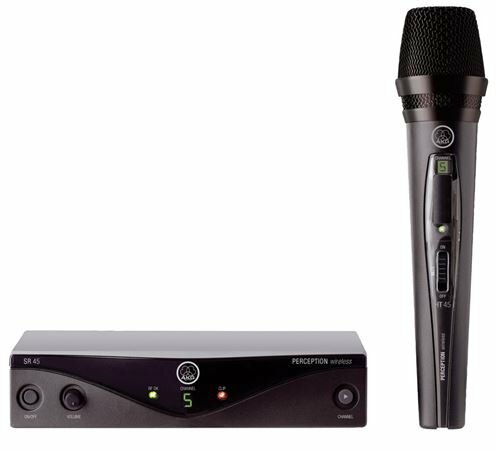 "Fantastic wireless microphone for all the studio needs"
Excellent value priced wireless mic. Shure wireless microphones may be just as good;however,for about half the price AKG will always be adequate for any and all of my studio recording needs. I vote 4.5 stars for Shure wireless mics due to the high price tag and a full five stars,5.0,for the AKG WMS45 wireless mic for they both really rock.Thanks!